Melanie Shankle is a graduate of Texas A&M and lives in San Antonio, Texas with her husband, Perry, and daughter, Caroline. Melanie began blogging in July 2006 when she started her blog, Big Mama. She’s also a regular contributor to The Pioneer Woman blog. Her first book, Sparkly Green Earrings, came out in February 2013 and debuted on the New York Times Bestseller list. Her second book, The Antelope in the Living Room, was released on February 4, 2014 and also hit the New York Times list. 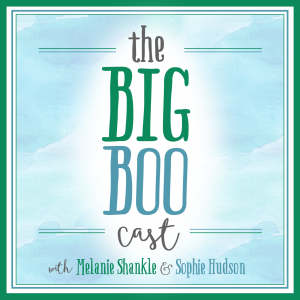 On this episode we discuss a retail store discovery that Sophie made that – NO LIE – has the potential to change your life. I can’t remember the last time I was so excited about something. We also talk about the Enneagram personality types and our respective families dynamics along with having to retrain our feet to walk in summer sandals. Melanie Shankle voted for Calypso as Best Humor in the Opening Round of the 2018 Goodreads Choice Awards. We’d love your help. Let us know what’s wrong with this preview of The Summer I Met Jack by Michelle Gable.